This NRG 5 minute custom imprint shower timer is perfect for utility companies, city government, retailers, and other businesses seeking to reach an audience with a powerful conservation product. 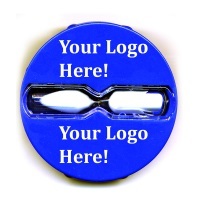 The custom imprint can be your logo, artwork, contact information, or any other message you want to include. This makes our custom shower timer a great tool for raising awareness or for marketing. By cutting shower time from 15 minutes to 5 minutes, one person could save up to 25 galleons per shower - that's 9,000 galleons per year.